Hearing sounds (specifically, a giant white moose singing) that the great beast has been pacified, Potty clambers out of the undergrowth and returns to his new fellows, holding aloft a large chunk of fungus. "Its for drawing you see." he says by way of explanation, "Now, onward to town is it?". He eyes the uncomfortable and itch-inducing pile of remaining turnips warily. "Phew! What an adventure that was! I wonder what awaits us next?" He helps to repack any remaining turnips, and back the wagon back on the road if necessary, then settles back in to the wagon, this time sitting up & peering down the road ahead, and into the woods surrounding, keen to spot anything else that might approach. Chegs gathers up his gear & climbs back onto the cart. He fishes out his father's own cider & takes a swing, before grabbing some cheese and a apple to eat. "Well wasn't that exciting? <urp> Oh my, please excuse me", says Chegs after a few bites of his food & another swig of cider. Roight. Time fer a feed me thinks! puffs Tet, wiping the sweat of exertion from his forehead with an oversized, checked kerchief. He breaks out his sizeable pack of supplies and offers around bread, cheese, dried fish, pear and a swig of home made cider. Tet eats twice as much as a hungry hobbet then remarks Crickey! Oi'm still famished. Our Hobbet Heroes cross into the Miskatonic watershed and reach the source of Peapod Brook. The clear, cold spring water is refreshing after a day of hard labor. Farmer Skip first tends to his animals and then reveals a mouth-watering surprise: a picnic basket full of ham sandwiches, dill pickles, granny smith apples, and oatmeal cookies! The Hobbets gather around the campfire and enjoy the excellent food. The farmer tells a spooky tale about the ghosts of dead adventurers, who emerge from the caves at night to haunt the villagers. The scary story puts everyone on edge, but blessedly the night watch passes uneventfully with no wandering monsters or bandit attacks. The temperature drops overnight, and by morning the ground is crunchy with frost. The final leg of the journey is easy going, downhill over a well-traveled dirt road. When it comes time for second breakfast, Skip stops the cart at a scenic overlook and points out some landmarks in the valley below. On the south bank of the Miskatonic River lies the village of Hornpipe. It consists of a few dozen buildings in the human style: above-ground structures with whitewashed wooden siding and gambrel roofs. On the west side of town, overlooking the docks, is a stone tower. And on the south side of town is an oddly-shaped hill with a windmill on top. "That is Hornpipe Hill," says the Farmer. "The miller is kindly to Hobbets, but don't expect a warm welcome from the other townsfolk. Many of them are cruel to Hobbets and do not want us in their homes or businesses. The one Hobbet-owned establishment where you can relax and let down your guard is the House of Pancakes. Come along now; we're almost there!" "The guard tower is headquarters for the town militia. A rude and nasty bunch, always spoiling for a fight. The building next to it is the mayor's house." Dougal frowns and mutters,"Then the House of Pancakes it is..." and waits for the Farmer to lead the way there. The ox cart rumbles down the pike on the last leg of the journey. The late-morning sun is strong, and the air is pleasantly warm. Soon our heroes enter Hornpipe from the southwest and roll past the guard tower. Dougal looks up and notices a pair of human crossbowmen glaring down at him from the parapets. "Fasten your hoods and cloaks, try not to attract attention, and if there's any trouble, let me do the talking," warns the farmer. He guides the team along the southern road, approaching Hornpipe Hill. Farmer Skip makes a sweeping gesture with his hand. "The miller is the biggest landowner in town. He owns Hornpipe Hill and the windmill on top. That small building next to the windmill is the House of Pancakes. The miller also owns the parcel of land directly across the street from the Hill. 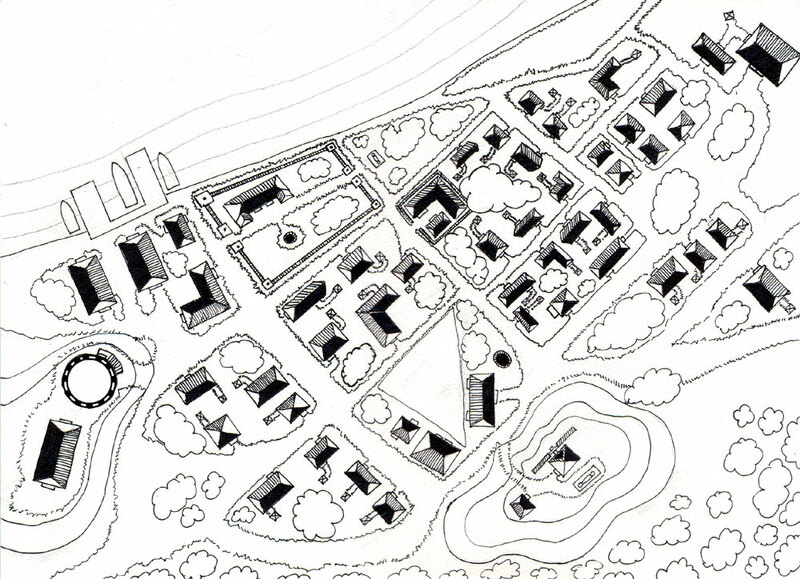 There is a triangle-shaped grain field, a barn, a warehouse, and a public house called the Miller's Tavern. He is one of the few honest men in Hornpipe. Look, there are two of his sons. They can show us where to unload. If you help me unpack these turnips and load up for my round trip, I'd be grateful and buy you each a stack of pancakes." Two teenage human boys are hard at work on their chores. When they recognize Farmer Skip, they greet him with kindness. The younger boy leads the oxen Burr and Dock to the barn, while the elder draws a key from a string around his neck and unlocks the warehouse door. The Hobbets observe that the miller's property is well-maintained and prosperous. The warehouse is neatly organized and well stocked. The miller's son points out where to stack the turnips, and indicates the sacks of flour that will be the farmer's return cargo back to the Hobbet lands. What do our heroes choose? Do they help the farmer, or do they wander off on some other adventure?